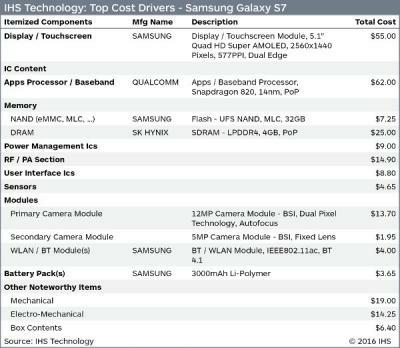 IHS performed a teardown of Samsung's Galaxy S7, and the company estimates that Samsung's latest flagship costs $255 to build - with a bill of materials (BOM) of $249.55. The retail price of the S7 is around $670 (Verizon, US). The most expensive component is the application processor which is based on Qualcomm's Snapdragon 820 chipset and is estimated at $62. The second most expensive part is SDC's 5.1" 2560x1440 (577 PPI) Super AMOLED display - which is estimated at $55. IHS tested the flat S7 and not the S7 edge - but in the table they released (see above) they say that display is Dual Edge display - which is a mistake. It will be interesting to have IHS estimate the 5.5" flexible OLED display used in the S7 edge. The flexible 5.1" flexible OLED on the S6 edge was estimate at $85 by IHS in April 2015. I estimate that Samsung managed to bring down the prices of its flexible OLEDs since.